Need to talk to a Tech Guy with 50 years experience? And not last weeks Employee of the Week at Burger King? No More Welding and Filing! This FBO Advance limiter plate will allow you to have the limiting abilities of a TRUE Mopar Performance Distributor in minutes. 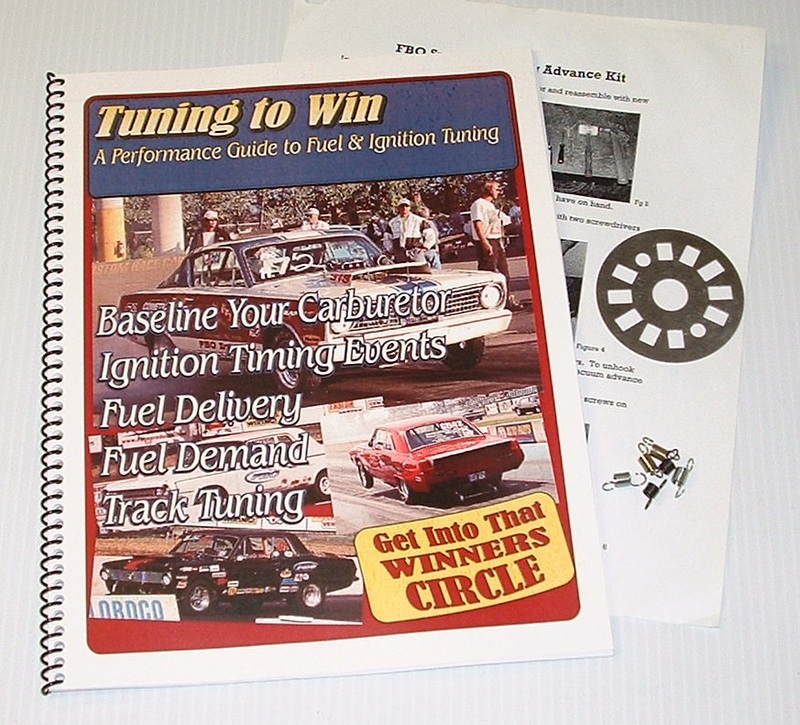 Quick easy and changeable as you build your engines performance level. One Masterfully Engineered Part gives you 0-10-12-14-16-18* of Mechanical Timing limits, changeable at any time. We all are aware that in order to run a performance engine especially with today's fuel formulations we need to have more initial timing in the motor but we still need to control the total timing which on most Mopar Engines is 34* or they will detonate. Note: Max Compression Ratios on pump gas with Iron heads is 9.5:1, aluminum heads 10.5:1, 1 point of compression will add 2-5HP but if you have to retard your total timing by 1* it could take out 5-20HP unless you running very high RPM's there is little to no gains achieved by building a motor with too much compression for pump gas, race gas is whole different set of rules. 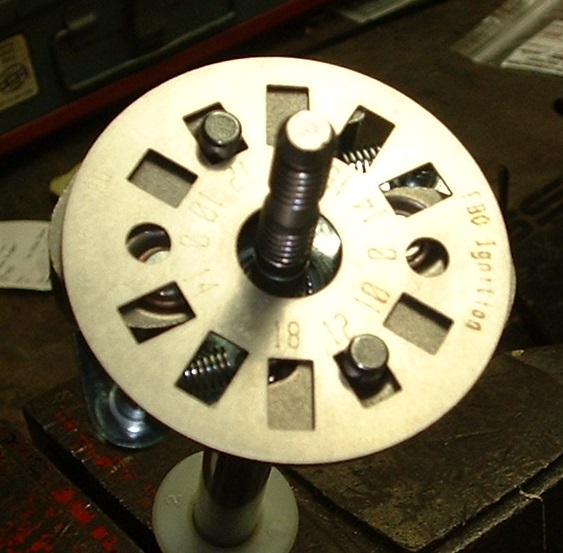 In the past the you stripped down the distributor to remove the T-Bar and then guessed how much to weld up the slots to shortened the total mechanical advance limit or the amount of travel the weights have, which is the mechanical timing limit. Once you had it all welded and filed smooth then you reassembled, ran the engine and checked the amount of total mechanical timing, then you took it all apart again and filed or welded more by guess and by golly and tried it again.... repeat several times to finally get it close and hope you have the slots both the same length. No more! 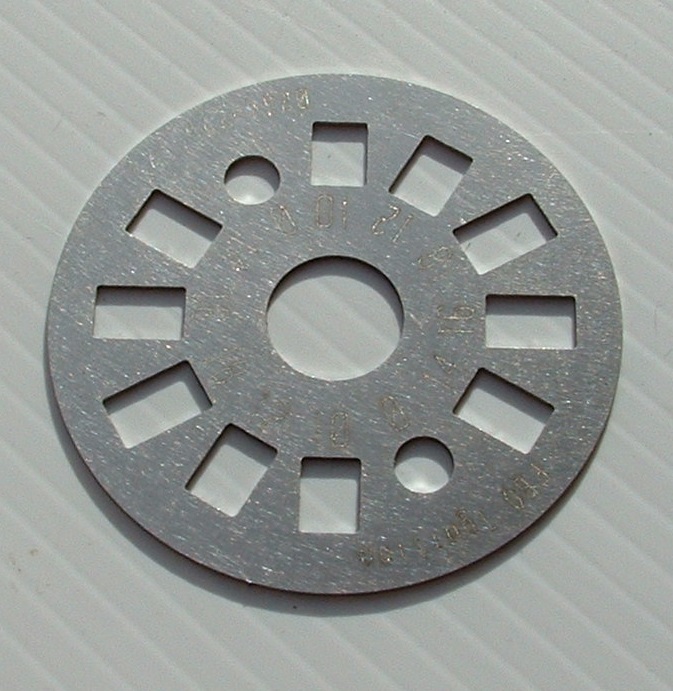 Whatever the amount of mechanical timing you need, select the slot, drop in the plate and your done! If you want to lock down the distributor with NO Mechanical timing at all then just drop the plate over the 0 round hole. Now you can have all the adjustability of a Mopar Performance distributor for a fraction of the cost. 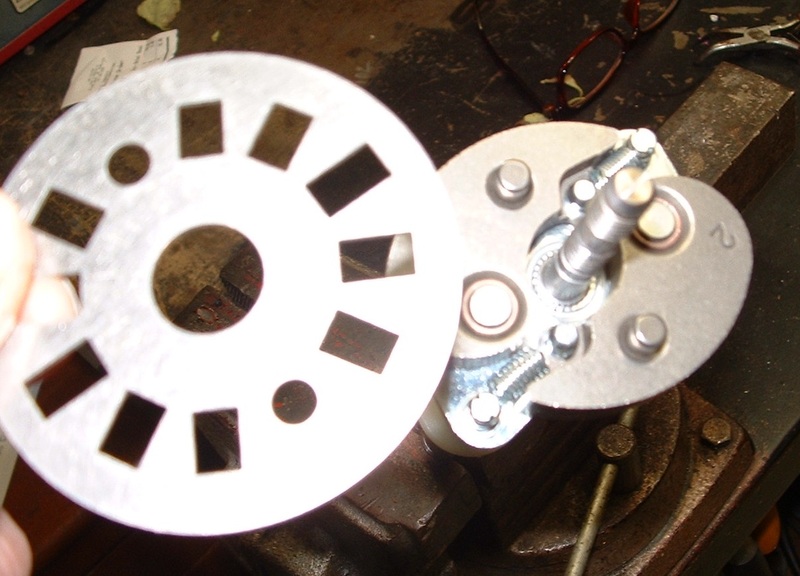 Simple installation with NO welding and filing and dead on perfect timing accuracy. LIFETIME Warranty on Workmanship and Material... yours or ours whichever is shortest. 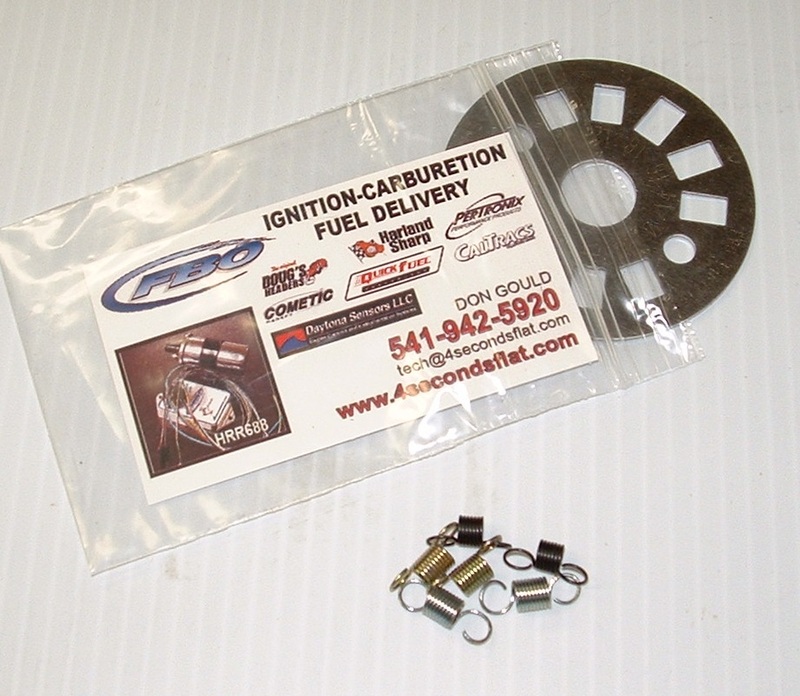 2018 Special: Purchase a J685 Limiter Plate ($25.00) or the MSD Limiter Bushings and receive a $20.00 coupon towards the purchase of the HRR688 Mopar Ignition kit, offer good for 90 Days after purchase date, transferable-YES, only one coupon per purchase. Can't be combined with any other offer, only through FBO Systems and not through dealers. Now Lets Perfect The Tune-Up! 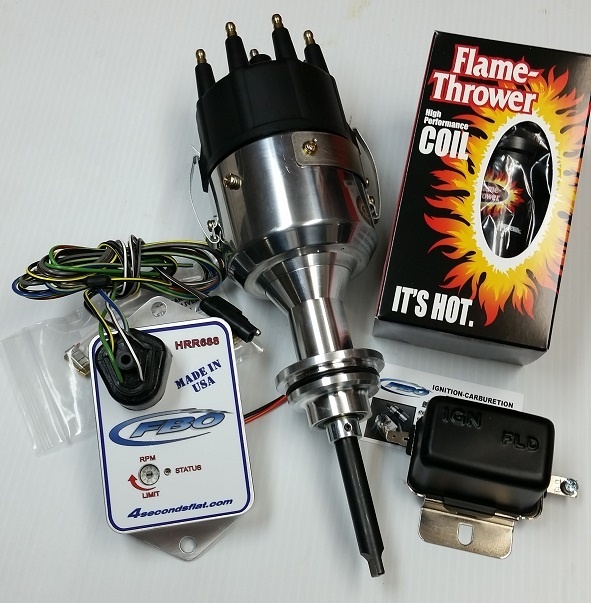 Now you've got 1/2 the job done, you've taken the time and invested in an excellent product to give your ignition a chance to operate correctly, but your only 1/2 way there. Now you need to address your old antiquated transistor type ECU which is working hard to take away everything you just achieved. Those old style Transistor ECU's from the 60's start retarding the timing at about 3200 and by 5200 most have pulled 8-10* of timing out of the motor! How can it possibly perform correctly when it's retarding the timing so drastically? 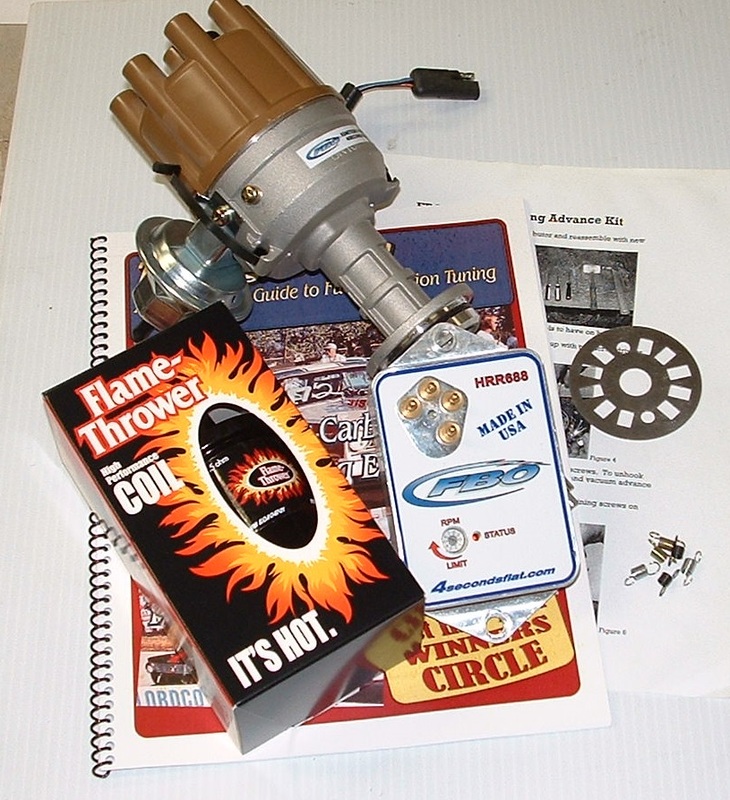 Retarding the timing will take out 5-20 HP out of the motor for every degree, depending on the performance level of your engine. The reliability of a Made In China Transistorized Orange, blue, green, pink, black whatever color ECU combined with the quality of the old unreliable ballast resistor makes your ignition a crap shoot, better carry spares, your going to need them. Rich stinky Idle? Carb won't respond to your adjustment? Stumbles? It's all in the timing events, get it fixed before you damage your engine! 2018 Special: When you purchase the J685 Mopar Limiter Plate or the MSD Limiter Bushing Kit you will receive a $20.00 Coupon that you can apply to the purchase of the HRR688 Ignition Kit. Coupon must be used within 90 Days and cannot be applied in conjunction with any other specials or promotions. How can we offer a 5 year Warranty? It's a simple formula, design it using the best engineering and components, use ISO 9000 certified suppliers to guarantee consistency in manufacturing. Do your research and apply your nearly 50 years of experience, do 6 years of R&D and testing so that it's right from the 1st piece made to the latest piece. Beware the Marketing Department: "New design, New for 2018, New Improved features." These statements are only telling you that there were problems in their original release. Check their warranty! Beware of ridiculous claims of massive HP gains over MSD I could write a book on why that statement doesn't make any sense. Wait, I did write a book! Compare our Warranty/Quality to any other Manufacturer! To Shop On Line simply mail a request for a PayPal invoice for the part number during business hours, usually just takes a few minutes. Just want to try the limiter plate 1st? 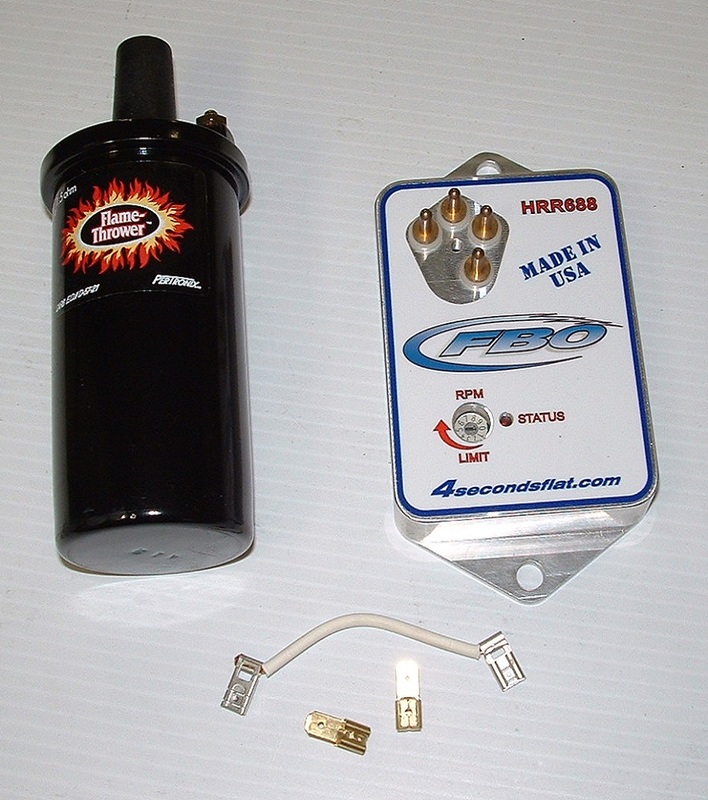 Limiter Plate, Spring kit, HRR688 Ignition module, Ballast Jumper Kit, PerTronix 40011 Super Hot Coil, Tuning to Win. Limiter Plate full instructions on line. There are no longer any Cast Mopar distributors available that meet our high quality standards. Everything is now made in China/Taiwan and to a quality level that is unacceptable to our rigid standards. Spectra has bought the last facility that was making a decent Mopar Distributor and overnight changed the design and quality to such a low standard that even we can't fix them or give them any type of warranty and if we can't give you a multi year warranty then we won't sell them. We Refuse to Sell Junk! We will not sacrifice OUR reputation for quality just to make you more money! Quality was lowered by 80%, but the price went up? 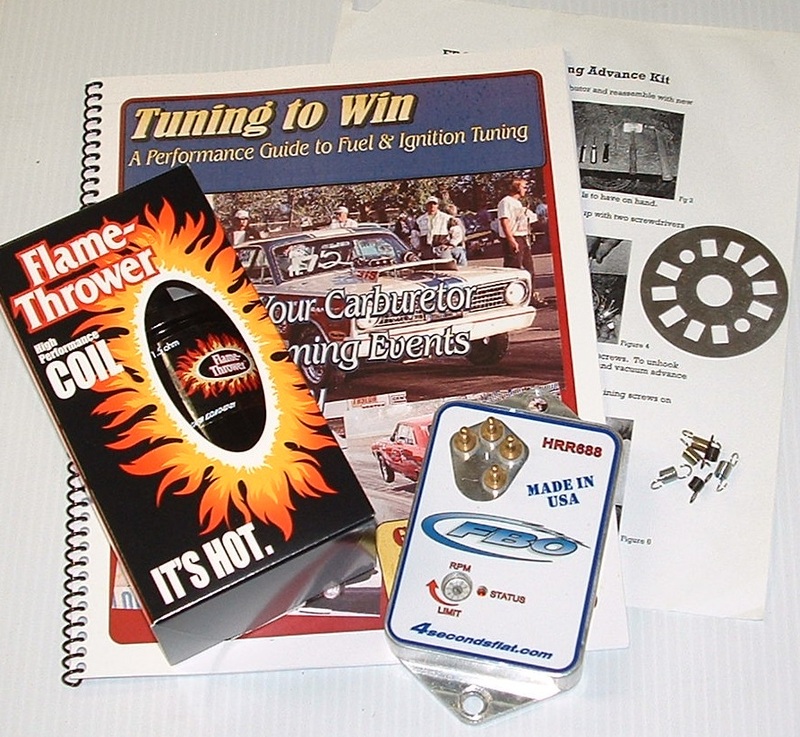 Everything you need to achieve the ultimate tune-up! Give it a try, We know you can do this! All as cast OE type distributors have been discontinued Our Supplier was bought out by a Chinese Manufacturer and the all quality was removed for Profit considerations, Price increased but quality is so low now even we can't make them work.. New Brand Name is "Spectra", beware! ProForm is also 100% Chinese and about the same quality level. Got MSD In Your Mopar? 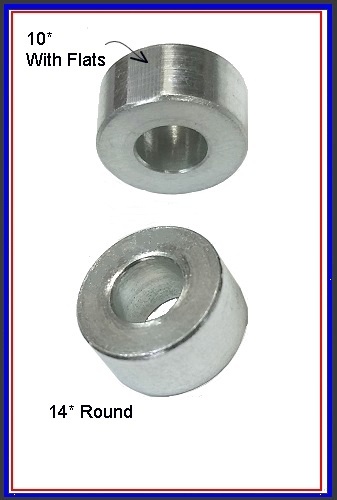 Advance limiter bushings for most MSD Pro Billet and regular Billet distributors. 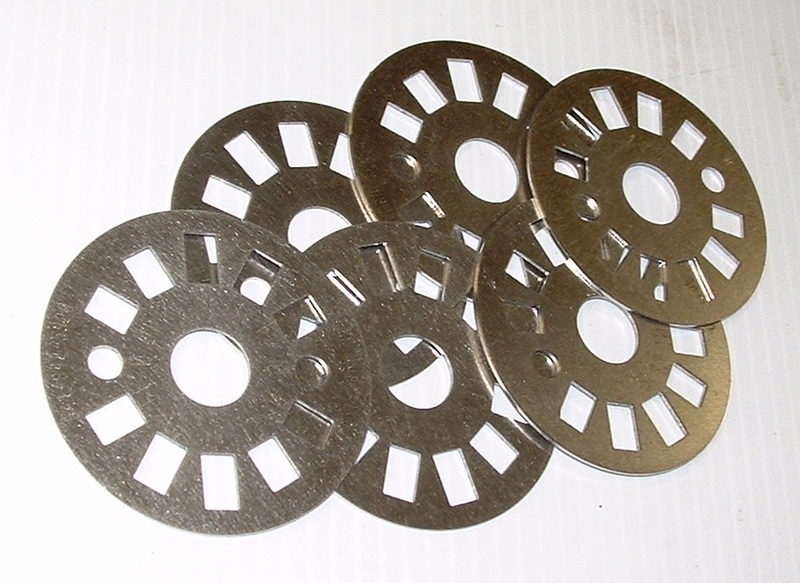 Each kit consists of a CNC machined 10* and 14* limiter bushing. Tired of MSD box failures, rusty distributors, inconsistency of your R2R unit? ?